Over the weekend, One Direction front man Harry Styles released his debut 10 song EP, respectfully self-titled. Completely stripping away and reinventing the sound he originally conceived as a group. Kickstarting what is sure to be a rigorous six month promotion cycle, the young musician hit up the “Today Show” to take part in one of their first Backyard Sessions of the season. 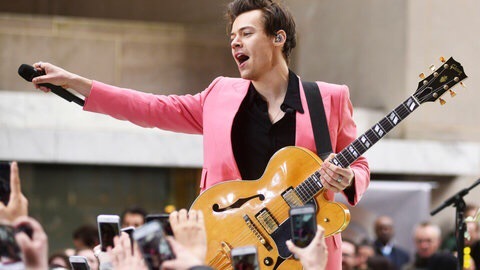 Performing ‘Carolina’ and his debut single ‘Sign of the Times’, Harry proved that he can stand his own, while looking pretty damn sly doing so. We’re also kind of digging the pink suite. Check out the performances below and be sure to give ‘Harry Styles’ a spin. Posted in Music and tagged harry styles, live, sign of the times, the today show, video. Bookmark the permalink.